This book focuses on the two psychological factors of naturalness and ease of viewing of three-dimensional high-definition television (3D HDTV) images. It has been said that distortions peculiar to stereoscopic images, such as the “puppet theater” effect or the “cardboard” effect, spoil the sense of presence. 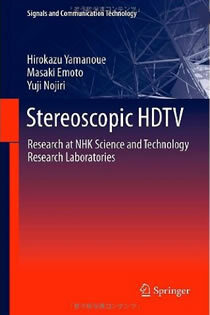 Whereas many earlier studies have focused on geometrical calculations about these distortions, this book instead describes the relationship between the naturalness of reproduced 3D HDTV images and the nonlinearity of depthwise reproduction. The ease of viewing of each scene is regarded as one of the causal factors of visual fatigue. Many of the earlier studies have been concerned with the accurate extraction of local parallax; however, this book describes the typical spatiotemporal distribution of parallax in 3D images. The purpose of the book is to examine the correlations between the psychological factors and amount of characteristics of parallax distribution in order to understand the characteristics of easy- and difficult-to-view images and then to seek to create a new 3D HDTV system that minimizes visual fatigue for the viewer. The book is an important resource for researchers who wish to investigate and better understand various psychological effects caused by stereoscopic images.